Getting Current location and display it with OSM ? Your phone's browser will ask you whether you want it to use your phone's GPS. Say "yes", and within a few seconds you'll see your current location on the map. I dont ask about How can I do that using the website ... I meant in ADT ? how can i program it ? 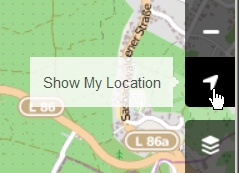 Do you mean "Finding your phone's current location" in ADT or "displaying an OSM-based map centred on your current location"? The first doesn't have anything to do with OSM and isn't really on-topic for here (the first question would be whether you want or need to do it via Google Play Services or not); the second might, but you'd need to give us more information about what you are actually trying to do. Sorry - don't actually understand what you're saying there. Hello Anas, do you want an app that displays your current position on an OSM based map, and if you walk to another building of your campus then you want a GPX track to be recorded and displayed? If yes, try OSMTracker or Osmand, both for your android devices. Or see OSM wiki for more apps.